Simple, elegant, and delicious, you can't go wrong with olives for a healthy snack. Olive bars have been popping up in supermarkets all over the country, and I, for one, am a BIG fan. 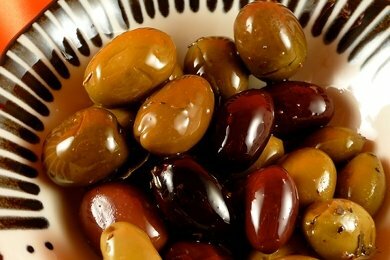 The first records of humans eating olives goes back to prehistoric times. You can envision our ancestors munching away on their yummy olive snack. Olives are the fruit of the olive tree steeped in brine (salt water). Green olives are picked before they are ripe and are packed in jars, brine-cured for eight months, and then bottled cold. You can also let the olives stay on the tree and ripen until they turn either purple or black, then pick them and pack them the same way. Olives in brine remain edible for many years stored in jugs, crocks, or jars in a pantry. No refrigeration is required and bacteria can't grow in the brine so supermarkets can put out trays of them without any potential health risks. Nutritionally, you can't go wrong. Olives are a whole food with good fat and important things like iron and Vitamin E. If you eat 6, you are consuming 20% of your daily allowance of sodium. Beware of black olives packed in a can. They have been artificially ripened (more processed) and are not as nutritious as olives packed in jars or in the trays at your local olive bar. My kids actually like olives. The strong taste doesn't put them off like other foods and I have had to cut them off from eating too many! My favorite olives are the ones photographed above. I like a mix of different shapes and colors with some herbs added to the brine for an unique taste. What's your favorite type of olive? Please share! I love calamata (greek) olives! They are my favorite. They are the reason I love a good greek salad, well, that and the feta:-) Also love olives with garlic or spicy olives... Really can you go wrong with olives? I don't think so... Yum! But they are packed in salt water, doesn't all the sodium just go right inside you? Unless you wash them off before eating, but often, if you are eating out, you do not have a choice. Well funny thing is that I just bought a large amount of the same olives you love at Whole Foods... I love these soooo much. I broke my wrist this past week and I lost my appetite...the only thing I wanted were Olives :) YUM! Kalamata absolutely float my boat! and throw some feta on the side for snacking!